Saint Maximus the Greek was the son of a rich Greek dignitary in the city of Arta (Epiros), and he received a splendid education. In his youth he travelled widely and he studied languages and sciences (i.e. intellectual disciplines) in Europe, spending time in Paris, Florence, and Venice. Upon returning to his native land, he went to Athos and became a monk at the Vatopedi monastery. And with enthusiasm he studied ancient manuscripts left on Athos by the Byzantine Emperors Andronicus Paleologos and John Kantakuzenos (who became monks). During this period the Moscow Great Prince Basil III (1505-1533) wanted to make an inventory of the Greek manuscripts and books of his mother, Sophia Paleologina, and he asked the Protos of the Holy Mountain, Igumen Simeon, to send him a translator. Saint Maximus was chosen to go to Moscow, for he had been brought up on secular and ecclesiastical books from his youth. Upon his arrival, he was asked to translate patristic and liturgical books into Slavonic, starting with the Annotated Psalter. Saint Maximus tried to fulfill his task, but since Slavonic was not his native language, there were certain imprecisions in the translations. Metropolitan Barlaam of Moscow highly valued the work of Saint Maximus, but when the See of Moscow was occupied by Metropolitan Daniel, the situation changed. The new Metropolitan ordered Saint Maximus to translate the Church History of Theodoritus of Cyrrhus into Slavonic. Saint Maximus absolutely refused this commission, pointing out that “in this history are included letters of the heretic Arius, and this might present danger for the semi-literate.” This refusal caused a rift between Maximus and the Metropolitan. Despite their differences, Saint Maximus continued to labor for the spiritual enlightenment of Rus. He wrote letters against Moslems, Roman Catholics, and pagans. He translated Saint John Chrysostom’s Commentaries on the Gospels of Matthew and John, and he also wrote several works of his own. When the Great Prince wished to divorce his wife Solomonia because of her infertility, the dauntless confessor Maximus sent the Prince his “Instructive Chapters on Initiating Right Belief,” in which he persuasively demonstrated that the Prince was obliged not to yield to bestial passions. The Prine never forgave Maximus for his audacity, and locked Saint Maximus in prison. From that moment a new period began in the life of the monk, filled with much suffering. Only after twenty years at Tver did they decide to let Maximus live freely, and remove the church excommunication. Saint Maximus, now about seventy years of age, spent the final years of his life at the Trinity-Sergiev Lavra. Oppression and work took their toil on his health, but his spirit remained vigorous, and he continued with his work. Together with his cell-attendant and disciple Nilus, the saint translated the Psalter from Greek into Slavonic. Saint Maximus reposed on January 21, 1556. He was buried at the northwest wall of the Holy Spirit church of the Trinity-Sergiev Lavra. Many manifestations of grace took place at the grave of Saint Maximus, and a Troparion and Kontakion were composed in his honor. 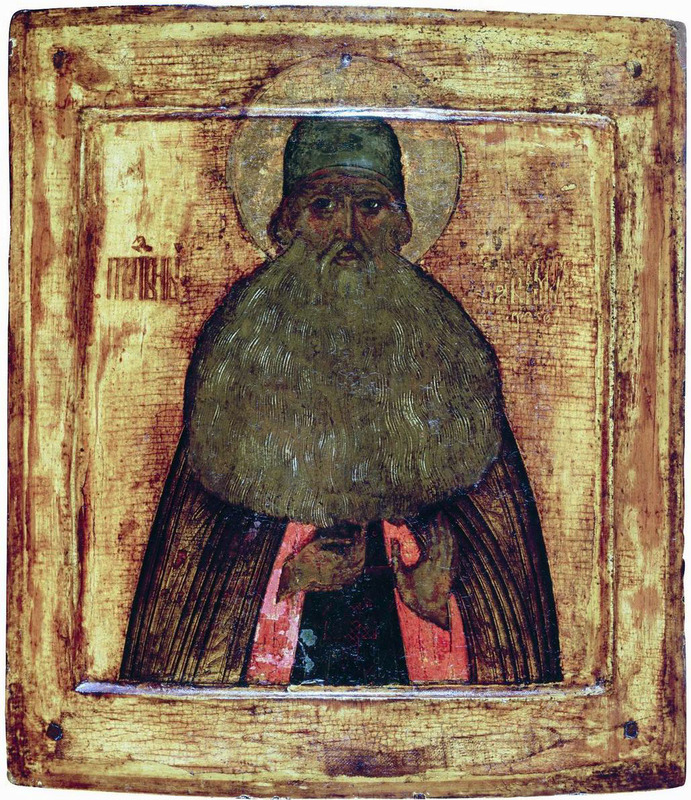 Saint Maximus is depicted on the icon of the Synaxis of the Saints of Radonezh (July 6). Зарею Духа облистаем,/ витийствующих богомудренно сподобился еси разумения,/ неведением омраченная сердца человеков светом благочестия просвещая,/ пресветел явился еси Православия светильник, Максиме преподобне,/ отонудуже ревности ради Всевидящаго/ отечества чужд и странен, Российския страны был еси пресельник,/ страдания темниц и заточения от самодержавнаго претерпев,/ десницею Вышняго венчаешися и чудодействуеши преславная./ И о нас ходатай буди непреложен,// чтущих любовию святую памятъ твою. Богодухновенным Писанием и богословия проповеданием/ неверствующих суемудрие обличил еси, всебогате,/ паче же, в Православии исправляя, на стезю истиннаго познания наставил еси,/ якоже свирель богогласная, услаждая слышащих разумы,/ непрестанно веселиши, Максиме досточудне,/ сего ради молим Тя:/ моли Христа Бога грехов оставление низпослати// верою поющим всесвятое твое успение, Максиме, отче наш.